Just a quick hit today - Among other projects on the painting table of late is some reinforcements for my House Cawdor gang in the form of Brother Hameln and his coterie of bomb rats! These little critters are from Anvil Industries, and includes a little detonator hand for their erstwhile controller. Tons of character to the sculpts, I'll almost feel bad running them into harm's way! 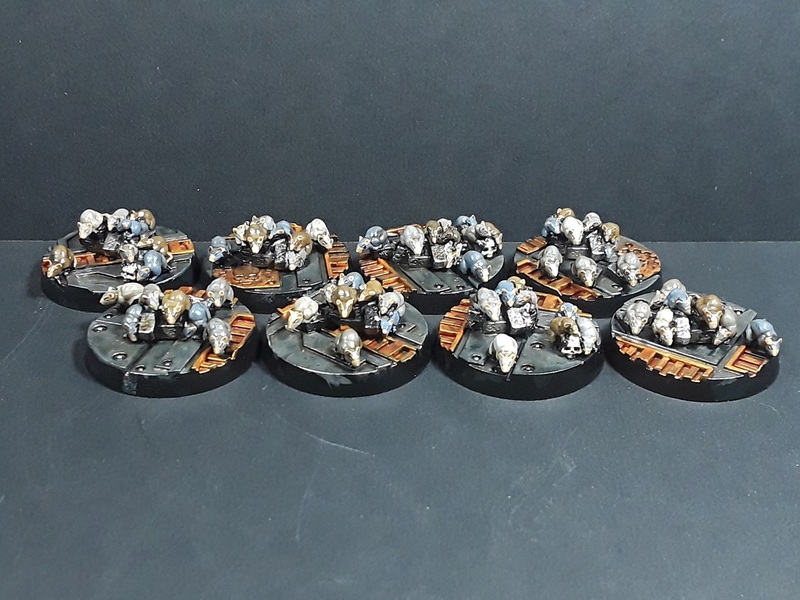 Anvil also does some great rat swarm models, so I figured I couldn't go wrong with a few bases full for special scenarios. 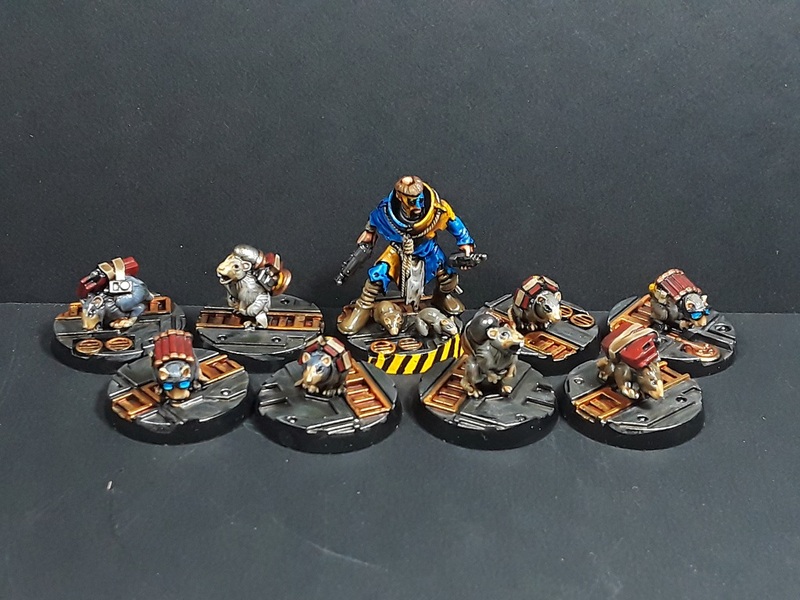 Hoping to get some games in over the upcoming weekend in preparation for a Necromunda event at Adepticon this year, pics to follow! Looks great! I love those bomb rat Models, been thinking of picking some up myself for a while. I can't help but notice that detonator bit is also sufficiently nondescript to pass for some sort of futuristic whistle, flute, or, well, pipe, and also that you've got him painted in a pied colour scheme ;) I probably would have called him Maurice tho. Indeed! Really pleased with the sculpts, definitely worth picking up a set or two! What a great idea hose swarms are. I shall pick some up. Cheers! I highly recommend Anvil Industries, I've loved everything I've ordered from 'em! These look great, very characterful as you say! And I'm sure these were actually deployed in WW1 or WW2, so based in the realms of fact. Incidentally: received my copy of Dave Taylor's book - I see you contributed a great article too. That is just too cool!! Indeed! As soon as I saw 'em I knew I had to order some! OMG! 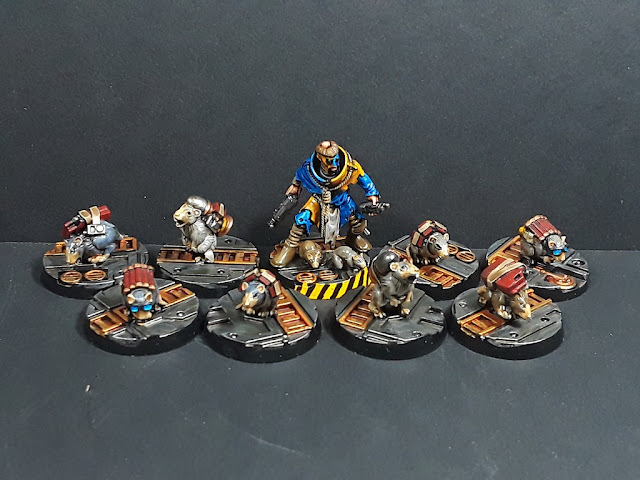 The bomb rats, LOVE 'em!!!!! Totally - They're just too good to pass up! Very cool sculpts. Good work bringing them to life! Indeed - They were a must-have as soon as I saw 'em! Hilarious! (well, for you, maybe not for the rats). He needs a pan pipe on his belt though! Hah! An excellent suggestion! I'm thinking of building a second handler and will definitely see what I can do! Great stuff, the paint servitor is getting no rest these days. Indeed! Been good to be back in the zone! Heresy Era Word Bearers - Army Complete! Testing... Is this thing still on?